On Sunday September 9, an exhibit that retells the stories of extraordinary acts was opened at the Holocaust Memorial Center Zekelman Family Campus in Farmington Hills. 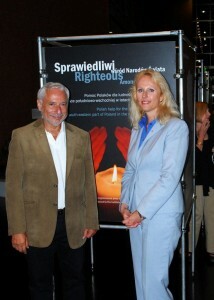 Paulina Kapuścińska, General Consul of Poland in Chicago and Konrad Zieliński, Vice Consul, participated in the ceremony opening the “Righteous Among Nations” exhibit. The opening event gathered some 150 people. There were many Polish Jews among the guests that evening. In private talks, some of them were expressing deep sentiments about Poland and home towns such as Warsaw or Wroclaw left behind. We met many people who miraculously passed through incredible ferocities and terror of the Holocaust. One older Lady we met survived from Auschwitz. She told us: “I was 13 when they sent me to the concentration camp. I am the only one from my entire family who stayed alive”. This exhibit honors the Polish “Righteous Among Nations.” These are men and women who rescued Jews from extermination by the Nazis. The exhibit focuses on only one part of Poland, Rzeszów. The exposition shows and documents several cases of extraordinary courage, bravery and faith revealed by Poles risking their own lives helping their Jewish brothers to survive German terror, murder and extermination. We have had the chance to see the pictures of the original documents, eye-catching and shocking photos, and we have read the accounts of witnesses to these terrible days. We have noticed that most of the documents were related to the Malopolska area, and specifically to aid for Jews during the time period from 1939-1945. The exposition should be visited by everybody from our entire ethnic group, not just by some of us who are from this region of Poland. Perhaps more importantly, we should also encourage our non-Polish friends to attend. Stephen M. Goldman, executive director of the Zekelman Family Campus, said he expects 7,000 people to see the exhibit. School groups have already scheduled tours. This exposition was presented for all those Poles who risked their own and their entire family’s lives, and tried and very frequently were able to help Jewish people survive German murderers who, following Hitler’s totalitarian ideology, were systematically implementing total extermination of the Jewish nation. One could find very well documented cases of help contributed by common people, priests and nuns. We were shocked to see layouts of several hiding places were Jews were forced to stay to have the chance to survive. You can find a list (at this time still incomplete) of Poles from the Rzeszow area who helped save the lives of Jews. The list is followed by pictures of people recognized by the Yad Vashem Institute in Jerusalem and honored by “the Righteous Among Nations” medals. The stories include the Ulma family — Jozef and Wiktoria Ulma — as well as their six children. All were shot and killed after it was discovered they had been housing eight Jews on their farm for almost two years. The traveling exhibit was brought to Metro Detroit through a partnership between the museum and the Consulate General of the Republic of Poland in Chicago. The exhibit consists of six large, four-panel stands of photos and stories of Polish men and women who worked to save the Jews from the Nazis during World War II. The exhibit, which is on display at the Holocaust Memorial Center located at 28123 Orchard Lake Road in Farmington Hills through Oct. 7, tells the story of a group of Polish gentiles living in Nazi German-occupied Poland during WWII who demonstrated extraordinary courage by helping to shelter and aid Jewish men, women and children during the Holocaust. The exhibit also documents the risks involved in this endeavor as Polish citizens were the only people in the Nazi German-occupied Europe who, along with their families, were summarily executed if caught sheltering or aiding Jews. Poland is the nation that has by far the highest number of honorees from any country awarded by the State of Israel with the Righteous Among Nations medal. This exhibit is a tribute to the rescuers, who, by saving a single life, helped save entire generations that flourish until this day. Michael H. Traison, a partner in the international law firm Miller Canfield, was among the speakers along with the Polish Consul General in Chicago and Holocaust Memorial Center Zekelman Family Campus Executive Director Stephen Goldman. Traison is widely recognized for his work for more than several decades preserving Jewish Heritage in Poland, promoting positive relations between the Polish and Jewish Nations and advocating human rights and Polish, Jewish and Israeli causes. He is the recipient of the Polish Heritage Award, Cavalier’s Cross awarded by the President of Poland, Jerusalem Humanitarian Award of Shaare Zedek Hospital, and, most recently, the Martin Sandler award of the America Israel Chamber of Commerce, Chicago. For more information about the exhibition call 248-553-2400.